Finally some heat! and babies of all ages love heat. It’s amazing how much your world broadens when you have another “room” to play in. A big bubble day. Lawn soccer, ball. Asa didn’t participate in these events, but did scrutinize the scene from a blanket on the deck, I think his new favourite hang out. Forest asked if Drea is “hanging out ” in Florida, where she arrived today for a holiday. How quickly the concept is learned, and how much we all enjoy doing it. Jen is passing on to her children her love of animals. I passed this on ours. My mother passed it down to my siblings and me. She had it passed down to her from her parents who were from a small farming community in Poland. The fact that my grandparents came to live an urban life in Canada, didn’t diminish their love of animals whatsoever, and in my childhood, in which these grandparents lived with my parents, we had pet chickens, rabbits, squirrels, snakes, dogs, cats.. It makes me feel so connected to them still as each new generation takes on this love like a cherished inheritance. 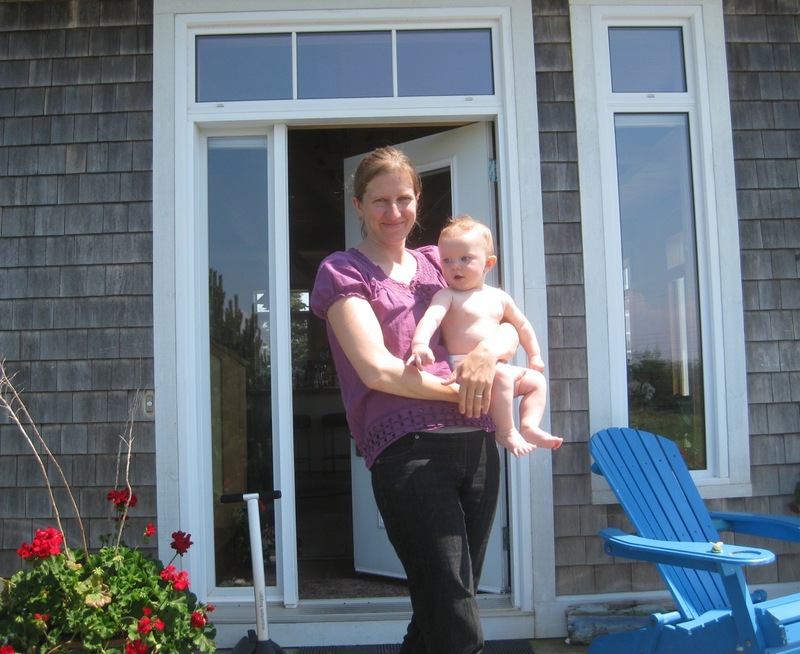 Another day of house hunting in Wolfville with Jen and her family. Will has a job now in Wolfville, starting next week, so the scramble is on. After all the looking, it was lovely to just meander through the very different countryside of the Valley. Different from our area. 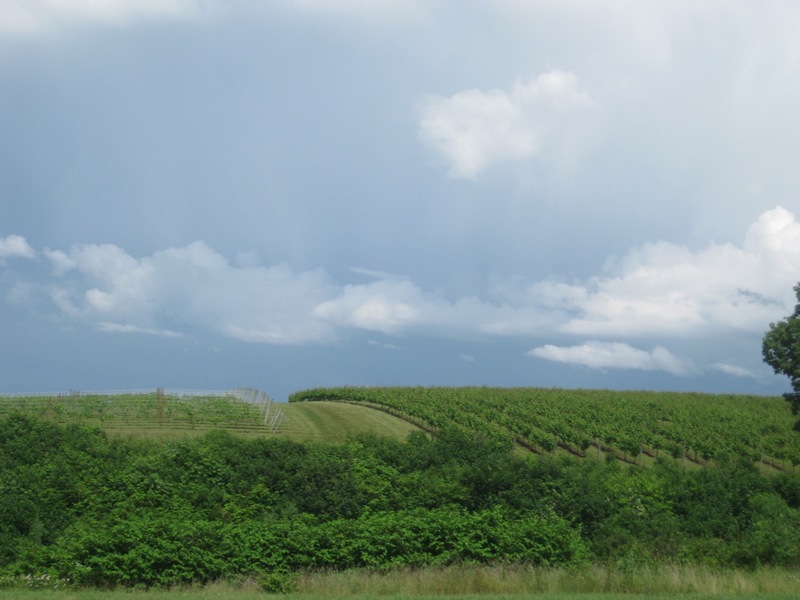 Wineries, lushness. There is such a beauty in all the differences. Like in all things, I need to remember to value the differences, rather than compare them. Today, when Jen and I took the boys to the library, Jen noticed this amazing creature on Asa’s car seat as we were to exit the car. Ergo, it must have come from our property. 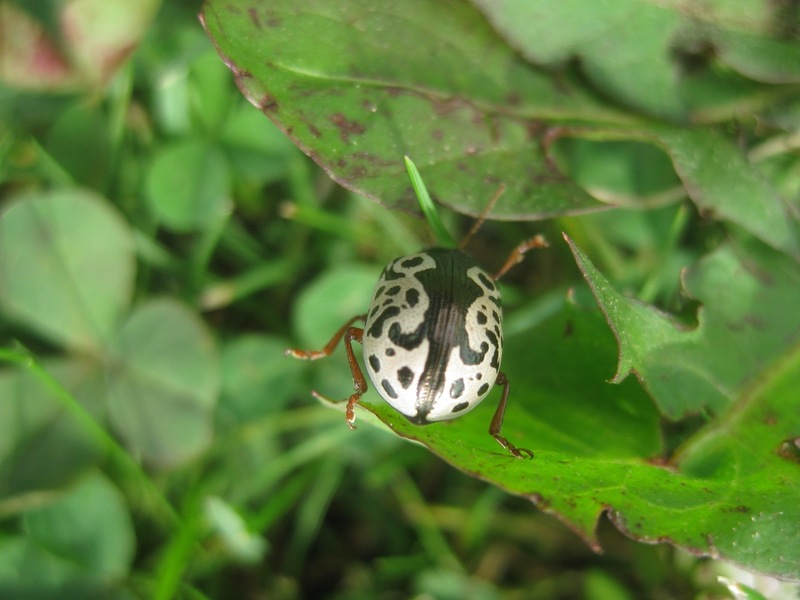 Lucky us, to have a Calligrapha Leaf Beetle gnawing on the leaves of our plants. We carefully removed the beetle and set it outside on the library grounds, for its moment of fame photo. Its back looks quilted. I love it! While walking the dogs with Frank and pushing baby Asa for his nap, I took my photo for the day, but I’m using Frank’s. That works for me too. The thing about the walk, is that people we bump into will ask us about the dogs, especially sweet Kaia, and not mention the baby. It’s clear we’re not the parents, and likely grandparents, but still I would expect conversation around the baby too. I think that dog conversation is just easier, less personal. I’ve always thought that walking a dog creates the chance for random friendliness. I just didn’t know that walking a baby doesn’t do the same…at least at my age. CLICK ON PHOTO The day started out foggy, ended foggy, but in between we had sun. We worked the gardens, getting them into a state of looking “cared for”. Our helper Forest loved this expression. He can add it to his increasing repertoire of idioms. Today’s weather challenge was a lesson in patience and perseverance. Each day into summer that starts out foggy, I handle less well. Sun, and the lack of it, affect a person’s mood. So, ergo, anytime I’m moody from now on, I’ll just blame the weather. What a great out. Another idiom for Mr. Trees. Here’s the photo that was to be with yesterday’s blog. Sorry about that. As well, at the end of this week, I need to change my blog as this site is no longer operational then. The new site might have ads…ugh…what can a little blogger do? By the way, isn’t Asa so cute? all small baby creatures, human and other animals, are made that way just so we’ll adore them, like a bear cub or fox kit. It works. Asa is growing like our weeds! He turned 6 months old today. We met him 6 months ago at his birth, and know the changes that will happen in the next 6 months. There is nothing like that first year. I think life is going quicker as I age, but Asa makes my life seem to be going at a snail’s pace compared to his. In about another month, we get to see our L.A. grandchildren, at their home. We’re so fortunate to have all six sweeties now living in North America. We’re so fortunate altogether. CLICK ON PHOTO Forest and I had a great deal of fun, creating a collage out of small fabric scraps. We chose, cut, glued, decided on more, critiqued, decided on still more, and finally I sewed down the whole thing. This piece of art will be framed and hang up in Forest’s room in his new house when the family moves to Wolfville. It was very rewarding to have something start out as a way to entertain Forest, and have it wind up as something that will hit the wall! It’s in the not being invested in the outcome…works every time. CLICK ON PHOTO We’re not getting the hot days of Toronto area, but we did “have us “some hot weather” today. So it was only a given that after art group, we’d wind up at Richard’s for a glass of CRW and the view. Days like this are so splendid, so appreciated.